Our planet’s magnetic field is the ultimate shield that guards life from the elements of space, particularly radiation. It’s enough to look at Mars, which also had a magnetic field but only for 500 million years, to see what could happen were it absent: what was likely once a “blue planet”, filled with vasts oceans of liquid water, maybe even vegetation and other life forms, is now a barred red rock. 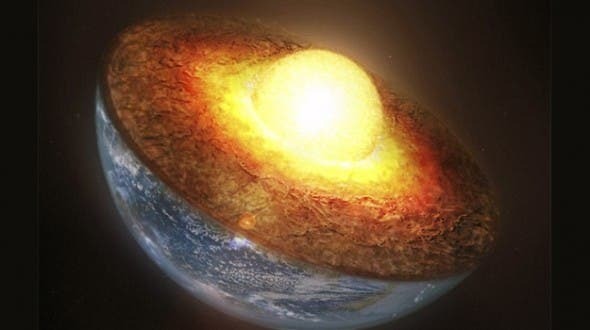 This invisible, protective shield likely existed shortly after the planet formed 4.5 billion years ago, when it was still a big blob of molten rock. It was only after the super hot iron liquid core lost enough heat to freeze (more properly said, it solidified) did the field become strong enough to allow life to foster. Previous studies estimated this happened sometime between 500 million and 2 billion years ago. A more refined analysis by University of Liverpool places the timeline between 1 billion and 1.5 billion years ago. Once the planet cooled down, it formed an outer crust while the inside was still liquid – like a glazed liquor candy. 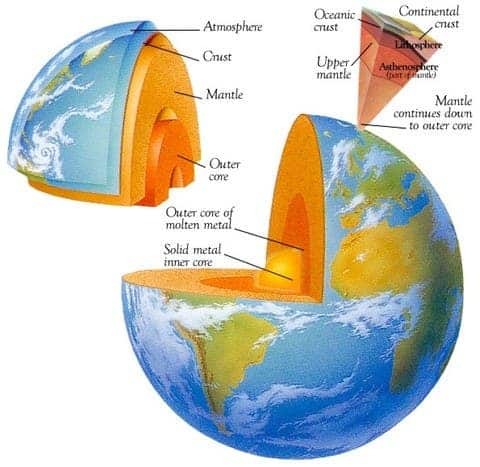 As the planet cooled further, heat was transferred from the core until it froze partially: the inner core became solid despite being smocking hot (at great pressure, matter like iron can still stay solid despite thousands of degrees Celsius), while the outer core stayed liquid. This process is called nucleation. The molten iron in the outer core is in constant churning movement, driven by convection as the outer core loses heat to the static mantle. This process is what keeps the planetary magnetic field floating above, and once the inner core solidified the field intensified, Liverpool researchers claim. To find out when the nucleation first began, Andy Biggin, a paleomagnetism researcher at the University of Liverpool, analyzed a database filled with the orientation and intensity of magnetic fields from ancient rocks. For instance, basalt contains magnetic minerals and as the rock is solidifying, these minerals align themselves in the direction of the magnetic field. By studying really ancient rocks, you can find out how the magnetic field was positioned at the time that these solidified. It’s very handy, and provides one of the strongest evidence in favor of the theory of plate tectonics. What Biggin and colleagues found that the steep increase in Earth’s magnetic field intensity occurred between 1.5 billion and 1 billion years ago. Moreover, the researchers were able to calculate that the solid inner core increases in diameter with 1 millimeter every year. “This finding could change our understanding of the Earth’s interior and its history,” Biggin said. While the Mars’ story might startle some, the good news is that Earth’s magnetic field is destined to be just as strong for another billion years, the researchers report in Nature. We have other problems to solve before that.